TOP MARKS: High school students are being encouraged into careers in the industry. 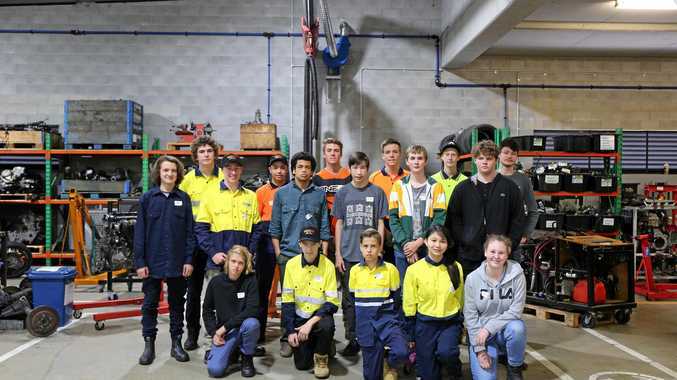 BRISBANE training provider the MTA Institute recently held its second Auto Camp, a three-day course designed to immerse high school students in the automotive industry. Held for the first time in the July school holidays and again in September, the course is held at the Sir Jack Brabham Automotive Centre of Excellence, a $10 million dollar state-of-the-art workshop. Students aged between 14 and 17 received hands-on experience in a range of automotive skills, from new technology such as hybrid/electric vehicles to the principles and maintenance of a vehicle. And not only is the course practical, it's also very popular. The course saw another full cohort of enthusiastic students getting involved in the program and coming away with an excellent set of baseline skills and knowledge of the industry. Daniel Schuh, a 14-year old student from Pinkenba attending Aviation State High School, decided to attend the camp after discovering a love for all things automotive when he was introduced to the motor trades by his family. "It was my first time in a mechanical workshop, so it was really cool to work with the tools and get my hands dirty with motors and learn about servicing a car - things that are really handy to know,” he said. The course is suited to all high school students and automotive experience isn't necessary. MTA Institute general manager Paul Kulpa said Auto Camp showed the future generation of workers where the automotive industry was now and where it was heading. , "Auto Camp will show the future generation of workers where the automotive industry is now and where it is heading, in a fun, hands-on environment. "We are aware that technology in the motor trades is evolving at a rapid pace and the purpose of Auto Camp is to show young men and women that there are many opportunities within the automotive industry and many more to come as innovative technology such as autonomous cars and electric vehicles enter the market,” Mr Kulpa said. Suet Yee Kong, centre, picks up some tips. Suet Yee Kong, a 16-year-old student from Stretton State College, heard about the camp through her school and decided to jump on the opportunity. "I've really enjoyed Auto Camp,” she said. There are plans for the MTA Institute to take Auto Camp to regional Queensland next year, to give high school students across the state exposure to the possibilities and opportunities that pursuing a career in the automotive industry can offer. The next Brisbane-based camp will be held from December 4-6.